Living in a van wan’t easy, or always warm. By the end of our Mazda Bongo hippie van experience, we’definitely become experts on how to live the van life. Organization, less-is-more, and don’t sweat the small stuff! We are back to living in a van again. When we first figured out how to live in a van back in December, it seemed like a pretty big deal. What started as a test of our ability to endure hardship, has actually become a pleasant existence! Thanks to my pastoral proclivities, hippie van living will probably not feature on any large scale in the next 40 years. For now, though, it’s great! Thanks to my commitment to fitness, this is not a problem. A look in my laundry bag reveals the mediocrity of my present life: work uniforms and workout clothes are all I need to do all I do. 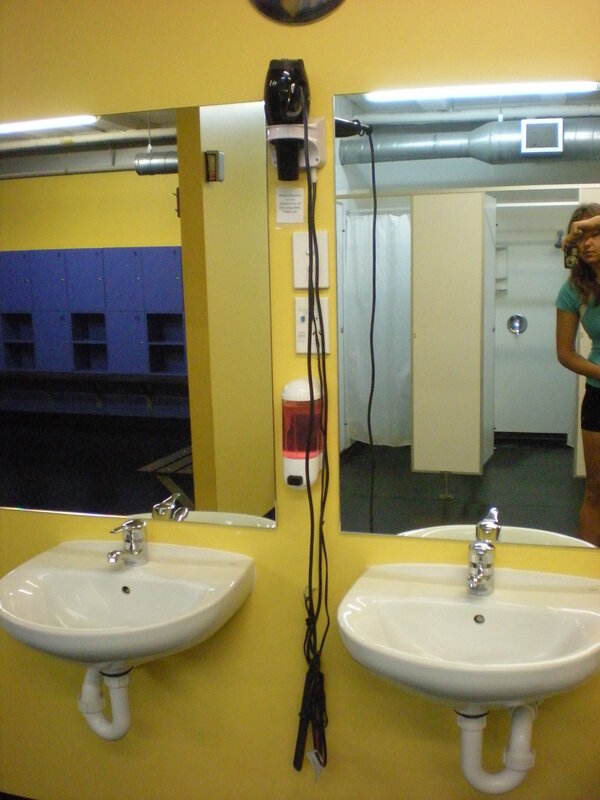 The first of my living in a van tips: join a gym, work out everyday, and shower thereafter. 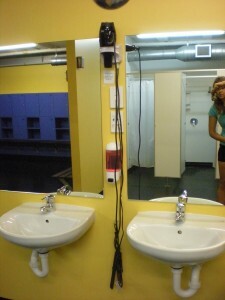 We did have one mishap when our gym wasn’t open! Well, see #1. The gym is usually my first stop in my daily van life. If not, that means I went straight to work, where there are also toilets. 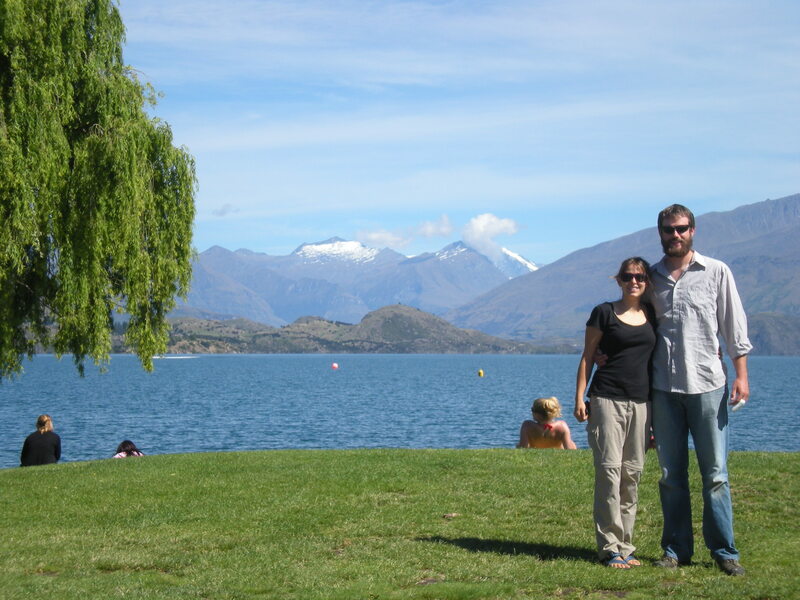 In a pinch, touristy Wanaka luckily has lots of public restrooms scattered around the town. Grocery stores and gas stations are a last resort. This part of living in a van is not a problem in tourist towns. Where do you get your food?” aThis how-to-live-in-a-van question posed to me by a lawyer from New York. The grocery store. Ha ha! No, really. They have fruits and vegetables and whole grains and meat and everything. Okay… the back of our hippie van has a wooden shelving unit that is our pantry. We have a “chilly bin” (cooler) for dairy, meat, etc., and we have two cookstoves on which the tall man makes delicious meals like stir fry, tacos, lentil stew, chicken and rice, etc. 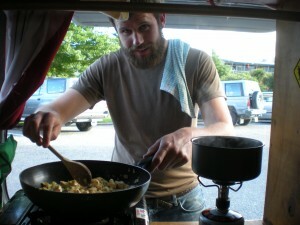 Perks of hippie van living – your own personal bearded chef! Creating a good cooking set up is a big part of figuring out how to live in a van. Laundry is tricky when living in a hippie van. It’s similar to RV living. We could hand wash in tubs, but laundromats are cool. I will own one some day. In the hippie van! Okay, this can actually be a tough one. We do our best to sleep for free. This is the point of living in a van, isn’t it? When we can’t we sometimes stay in campgrounds. For Americans who have to pay to camp, this friend referral link for HipCamp – like AirBnb for camping – will cut your cost by $20. 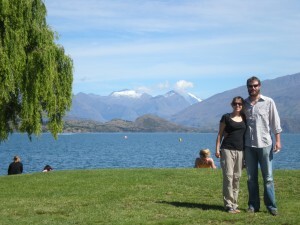 In New Zealand, DOC has some really cheap ($5) or free campgrounds. In Canada, Crown Land can be camped on for free. Japan and Australia both have lots of free camping. In the US, you can camp free in National Forests. Our hippie van “sleeping quarters.” Living in a van requires some logistical hurdles not unlike RV living, but it’s worth it! But when you’re in a city like us, you have to be careful when sleeping for free. No one likes weird hippie van people parked in front of their house (at least I didn’t at my former residence). 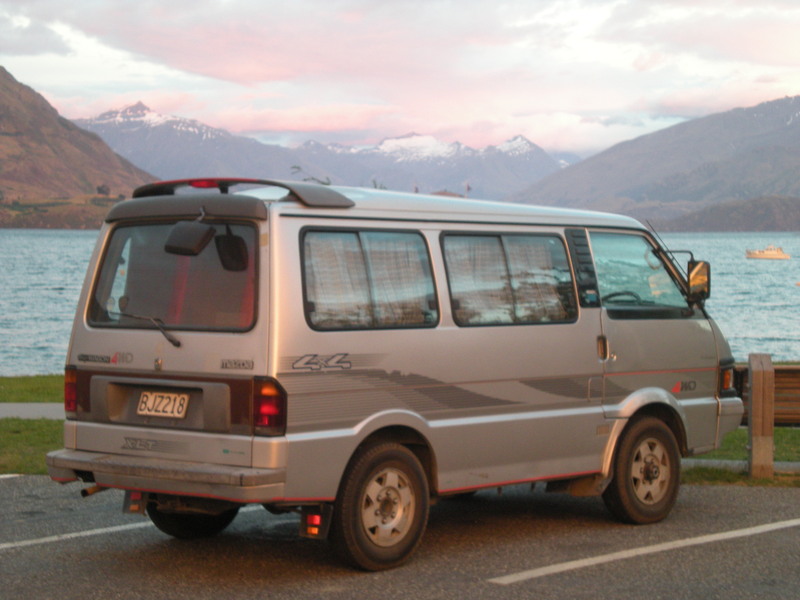 To make matters more difficult, there is actually an anti-van culture in New Zealand. As is common, the few have ruined living in a van for the many. bHuman waste has been found in places frequented by campervans, causing local communities frustration aimed at anyone living in a van. I suspect New Zealanders might look to their own citizens a little more often in the blame game – a recent police report elaborated on actually catching a local in the act. Nonetheless, the stereotype is stuck in the popular mind. To complicate matters further, many campervans are rentals with outspoken paint jobs. 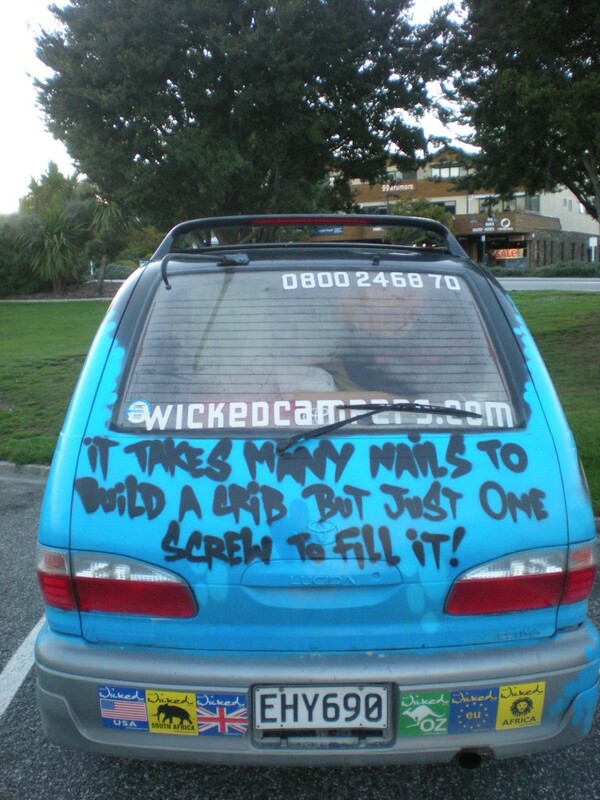 The worst are “Wicked” campervans complete with offensive quips painted across the rear of the van. One of the best living-in-a-van tips I can give is to be ready to deal with lots of stereotypes. Living in a van can be difficult with awful hippie vans like this everywhere. How to live in a van 101: avoid wild paint jobs! So, how do we deal with this sensitive issue? Don’t laugh. I keep a chart of all the different places we’ve found to park while living in a van. I make sure that we don’t stay in the same place more than once in seven days. These spots include parking lots, quiet neighborhoods, industrial areas, and dead-end roads. We also vacate these places right around sunrise cwhich in the height of summer’s longest days was a bit miserable. We’ve had offers from friends to park at their houses, but that’s a bit awkward since there is no social script for that sort of thing. Do you announce your arrival? 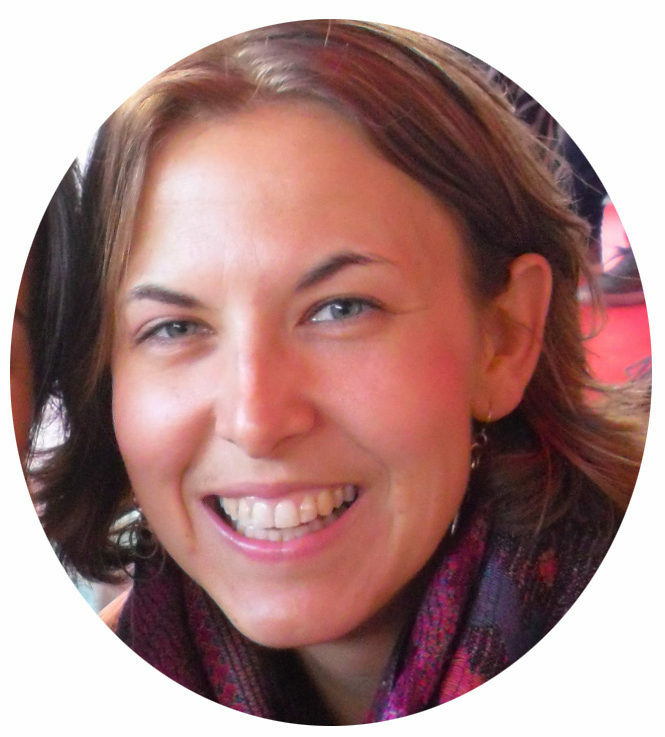 Have a chat? Do you say goodbye? Do you just leave them be? If we got asked to leave someplace, we’d take a friend up on their offer. Let’s hope it never comes to that! This is the best part of living in a van! The lakefront has a long, narrow parking lot with a dazzling view to accommodate all the tourists. The best wireless internet deal in town dInternet is NEVER free in New Zealand. Even at the library!!! is from the information center on the waterfront. When I’m not at work or running errands, I park at the waterfront, write, email, organize myself, cook, do paperwork, make U.S. phone calls, clean “house,” etc. Another perk when you live in a van, places like this are your front/backyard! So why is living in a van great? First of all, when not at work, I’m always “outside,” which I love. Also, the simplicity of living in a van is a beautiful thing. My mental health is directly related to how “organized” or “sorted” I feel. If I have lots of unaccomplished adult tasks in my life – laundry piled up, dirty dishes in the sink, floors need vacuumed, clothes need folded, clutter on the kitchen table needs put away – a sense of failure keeps me stressed out until those things are accomplished. At “home,” it’s common to deal with that stress by snuggling up with a book or vegging out on the internet or T.V. for hours. Living in a hippie van, you have to face the music. Everything takes place on the same surface, which, in its final hours, serves as a bed. Therefore everything has to be done by bedtime! This is the essence of living in a van. There you have it: how to live in a van! 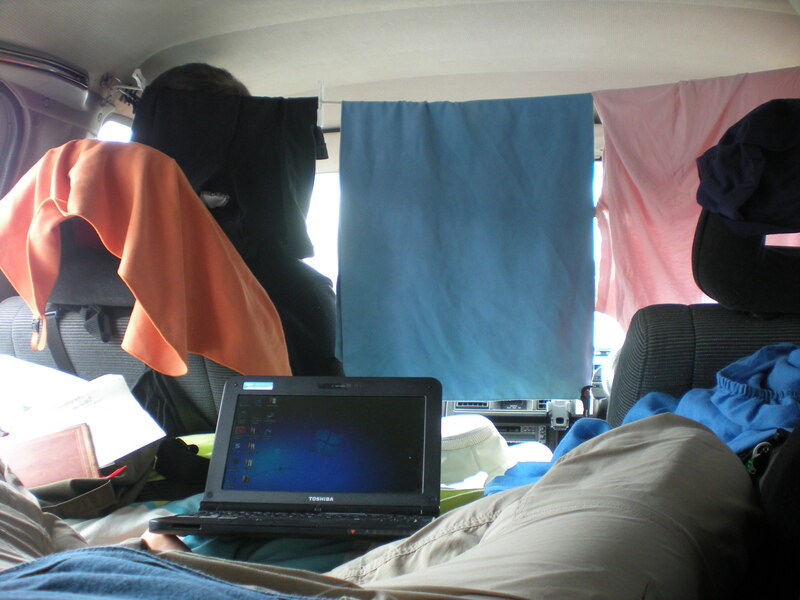 Read about jobless, traveling van life in Hippie Logistics: Part II. Sign up to beta-test a new platform (better than Craigslist!) for buying, selling, and getting information about vans. Flying to your van-travel destination? Get there with free flights! When you want to take breaks from living in your van, Become a Housesitter. If you need to cash up, consider these 24 Jobs for Travelers. When you start craving being a part of something, Work Exchange! a. ↑ This how-to-live-in-a-van question posed to me by a lawyer from New York. b. ↑ Human waste has been found in places frequented by campervans, causing local communities frustration aimed at anyone living in a van. I suspect New Zealanders might look to their own citizens a little more often in the blame game – a recent police report elaborated on actually catching a local in the act. Nonetheless, the stereotype is stuck in the popular mind. d. ↑ Internet is NEVER free in New Zealand. Even at the library!!! Good luck – van life is a great adventure! I’m not sure I can clearly answer your question, but I’ll try! 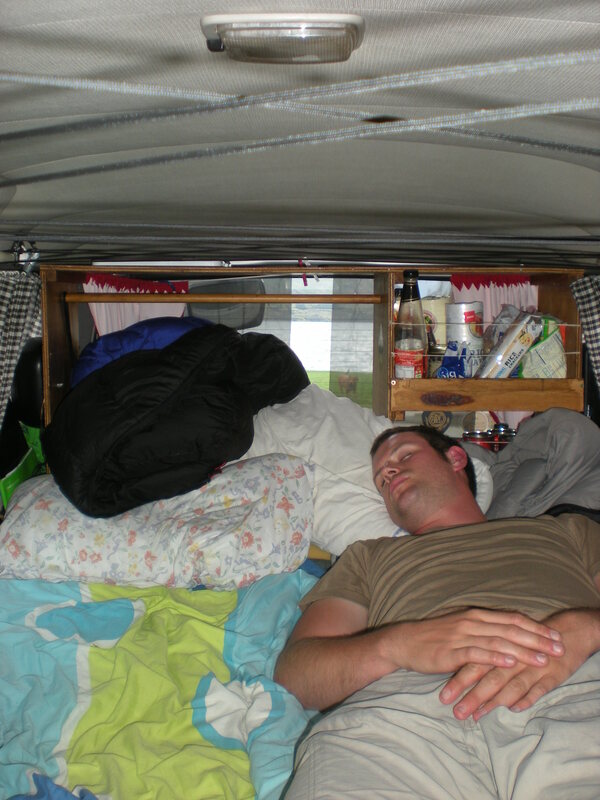 When my partner and I lived in a van, I waitressed and bartended. He was a delivery truck driver and a dishwasher. Personally, I think you can do any job living in a van.